We strive to provide the Seattle area as an additional resource for families who need assistance. Passionate, big smile, love of the game. Colin started playing soccer but soon realized his true calling was in the ‘coolest’ game on earth…Ice Hockey. 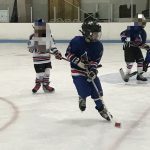 He hit the ice for the first time three years ago at the age of five during a ‘free learn-to-play’ session at Olympic View Arena and has not stopped since. Like many of us when we were all kids, all Colin wants to do is eat, drink, and sleep hockey, playing at every moment he has the chance to. This year and coming season will be really tight financially for the family with Colin’s dad, Steve, going back to school full time to be able to better help the family in the future while tag teaming shifts at a local bar with Colin’s mom, Mary, so they can have someone at home with Colin and his 2.5 year old younger sister, Rosalyn. Mary and Steve have been trying to figure out how to keep Colin in hockey…enter Seattle Youth Hockey Assist and you, our supporters. The Twigg family is perfect for what Seattle Youth Hockey Assist is about—assisting local families in times of need, who are working to help themselves at the same time. Mike Ringstad, Tom Sprague, Olen Anderson, and I are really excited to welcome Colin, Rosalyn, Mary, and Steve to our family and assist in Colin’s 2018 hockey season. Kian Bray is 8 years old. 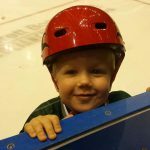 He fell in love with hockey when he was about 2 years old when his parents (Jeff and Elizabeth) took him to his first Silvertips games. He told them he “wanted to do that!” So they put him in ice skating lessons at age 3 (Snowplow Sam), and after some initial struggle, he got the hang of it, especially thanks to a figure skater named Linda who was helping out with lessons and gave him some much needed one-on-one attention. But, he soon got bored. By that fall, Jeff and Elizabeth had met a mom of an older hockey player (a parent of a student in Elizabeth’s class) and she said he probably wanted a stick in his hands. So they ditched skating lessons and enrolled him in beginner hockey at Everett. Kian loved it! He played 2 years developing with the beginner program, one year at the 6U level, and is now in his 2nd year playing at the 8U level. Kian has always had a passion for playing goalie, although he learned some difficult lessons in this position in the winter of 17-18. He still wants to play goalie, but also tasted his first goal in Canada in March 2018 and LOVED that! He’s excited to go see the Sharks vs. the Canucks again in February with his Dad! Kian’s may not be the fastest, but he’s a versatile player and learning all the bits and pieces all over the ice! He’s a great teammate! In the off season, Kian plays whatever sport he feels led to play – he’s taken swim lessons, played soccer, t-ball, and baseball. Sometimes he thinks about football or basketball, but hockey takes precedence! 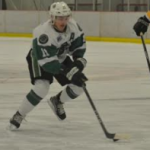 Braden Sanchez is a local Pacific Northwest player who has benefited from a Junior Hockey organization in the Greater Seattle Area. 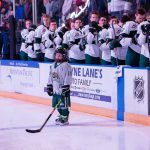 The Seattle Totems have given many kids like Braden opportunities to play and experience Junior hockey while staying in their home area. For Braden, this means he does not have to choose between moving away to play Junior hockey or staying home to help with family matters; instead Braden can help with his family while playing the sport he’s loved since he was a toddler. However, because the Seattle Totems are like numerous Junior A Tier II teams across the nation, there is a fee paid by the players. Braden has very limited free time, if any, with the commitment it takes to play at the Junior level and with his commitment to his family, which means he is not able to work. Braden is a compassionate, hard working individual and he brings a selfless, team first attitude to every aspect of his life. 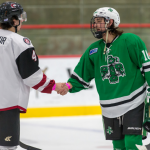 It would be a detriment to the sport of Hockey to not provide a little assistance so a kid like Braden could continue his junior hockey career and potentially move on to the college level. 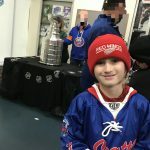 Copyright © 2019 Seattle Youth Hockey Assist. Proudly powered by WordPress	& The WP Theme by ceewp.com.